Twilio is a platform as a service that allows us to programatically make and receive phone calls and setup other services by using its API. Setting this up usually requires developing skills, but at Flexie CRM we made things very easy for you. Only with a few steps you can take advantage of a very powerful feature like making and receiving calls right inside your Flexie CRM. As a first step to activating this feature, an account in Twilio is required. After creating an account, you will be given an Account SID and Account Token. This information is shown in the Twilio Dashboard and Settings. As a second step you will purchase a Twilio number by navigating to the main menu on Super Network section then click Phone Numbers. In this section you can buy a phone number that will be used to setup the Twilio phone in Flexie CRM. To start configuring Twilio you have to check if the addon is activated: Flexie CRM -> Settings -> Manage Addons. There you will notice the Twilio Phone add-on listed. By default this add-on is activated. If it is not, then you go ahead and activate it. Open Settings again and at the bottom of the menu you will see the Twilio Phone configuration menu. Navigate to Twilio Phone -> Account to continue with the configuration and click on the new button. The below screen will be shown that will require to fill the account data. Leave blank the Incoming Call Timeout and Incoming Call Failure URL at this time. We will need those two configuration if we will setup voice mail which will be covered in another topic. Make sure to activate the Record Calls switch and then click on Save & Close. Navigate to Twilio Phone -> Twilio Number to select the numbers you have purchased from Twilio. You may have more than one number so you can give permission to your users on each of them. In the Phone Number dropdown you have a list of all the purchased numbers from Twilio. In the users dropdown you can give permission to users for the selected number. Configure your permission preferences for the phone number you will use and then click Save & Close. 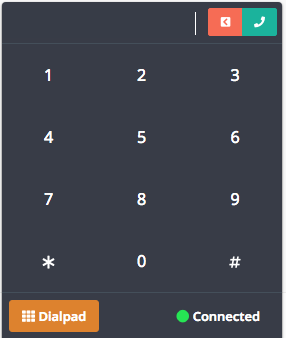 When a user login to Flexie CRM will see the Twilio softphone integrated and connected. A successful configuration will have the below screen appearance in Flexie CRM. By clicking on the Dialpad the phone screen will open up where you can type the phone number you wish to call. If someone calls your number instead, you will see the screen below. 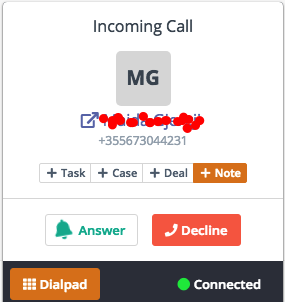 If the phone number calling your Twilio number belongs to a contact or a lead its name will show. Also, in the Twilio Phone -> Twilio Stats you can see all the recorded call logs and play them directly from inside Flexie CRM. This configuration is made very easy for you and in the same time is so powerful feature.